I’m in the process of making a whole row of them to run along a wall in my kitchen. I rarely have time to make things for myself, but I’m determined to finish these ones, if it’s the last thing I do!! They’ll all be decorated with recipes written in my mum and my grandmothers handwriting, and I might just have to add my sisters and my own to that collection too. Saves getting out the recipe books! Whenever I make work, I photograph it a lot - from all different angles, in different groupings, lines, rows, light. I find it gives me an added perspective on the work, which you sometimes miss when you’ve been working on something up close for a while. Sometimes it leads to new ideas, new thoughts on how to present work, new ideas on where to take it next. And just in case you haven't noticed, I also have a bit of a compulsive need to arrange things in lines and rows and grids…aaaah....something sooooo satisfying about it! 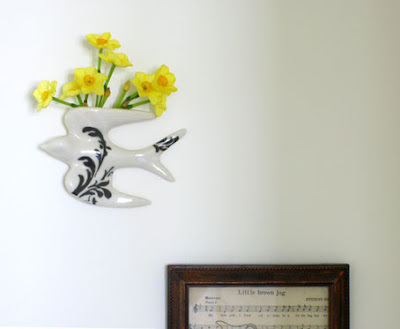 I’ve also made a small edition of these bird wall vases (below). They’re part of a much bigger wall piece that I’m working on, but I just snuck a few out for those nice folk at Object! Brilliant! I love that idea of using the handwriting. I wish I had got to keep my Granny's handwritten cookbook. They will look great in the kitchen, fantastic :-) and I know what you mean about photographing your work. I do that too! I like the new birds, curious about the larger piece, will look forward to seeing it...and love the stark black as always. by the way the article in CA&P looks amazing! you art star you! As a means of exhibiting the spoon in recipe (for lack of a better name) I think it's also rather brilliant. I can't wait to see them with the hand written recipes. 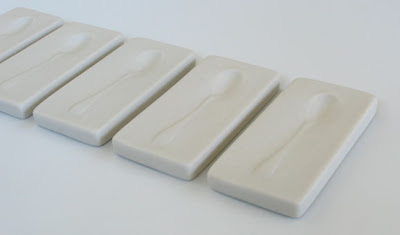 Just curious though are these made of porcelain? And then hand painted, or another means or transposing script. Hi gypsy junk knits!! And thanks! 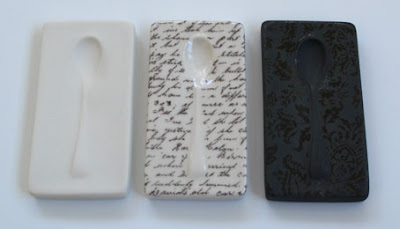 Yes, they are porcelain, and no, they're not hand painted. The imagery is made using decals, which are kind of like a "transfer" but printed using ceramic ink. And I'm afraid my etsy shop has been tragically neglected....!! Oh my God Mel!!! 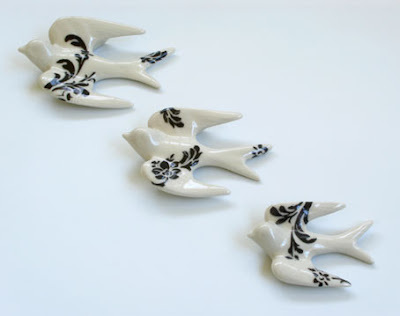 I absolutely love these bird vases- you are a star! Will they be on etsy, well? huh? will they???? 'fraid not reb! They're for an exhibition piece i'm working on so don't think they will get to etsy. actually, nothing is getting to etsy right now! 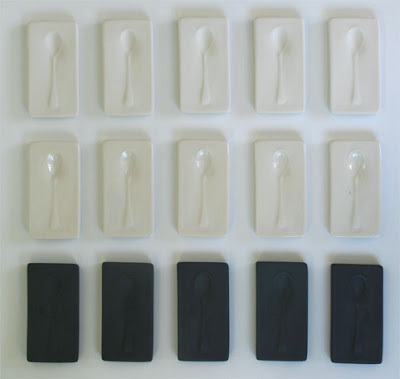 your spoon pieces are wonderful! I hope I get time to look at more of your work, 5'm a sucker for ceramics, and a real sucker for anything with text on it!